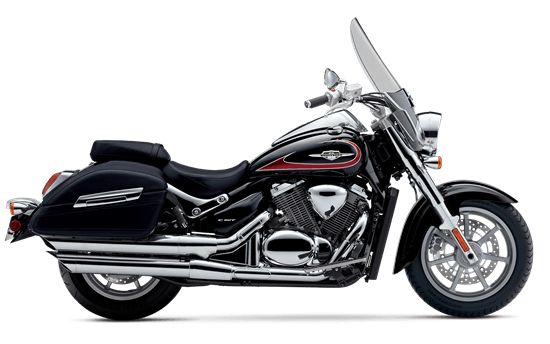 The Suzuki Boulevard C90T is powered by a 90 cubic-inch V-twin engine that delivers exceptional torque for outstanding acceleration in every gear. It also features fully integrated leather-look, rigid side cases and a comfortable passenger seat, all behind a large windscreen for remarkably comfortable cruising on the open road. With bold, classic styling, the C90T is also designed to capture attention whether you’re cruising down the boulevard or kicking back at a rest stop. The appeal of classic styling is combined with the benefits of modern performance, with the steel-tube frame comfortably carrying the rider and confidently housing the powerful engine. The standard windshield provides classic styling with unique chrome garnish with Boulevard emblems and offers full wind protection. The windscreen is positioned and designed to provide ample wind protection at freeway speeds. 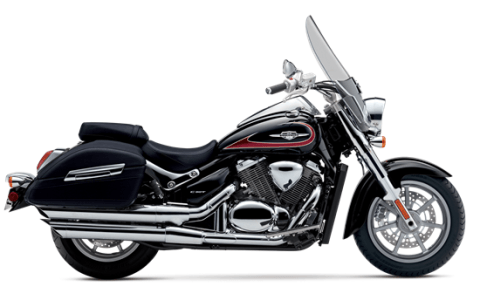 With subtle Suzuki Boulevard styling, the firmly mounted windscreen offers protection without distraction. Wind buffeting is minimized by allowing just the right amount of air to pass above the headlight. Additional touring-friendly features include well-positioned footboards, 4.8 gal. fuel tank and shaft drive. Stout telescopic front forks deliver generous 5.1 in. of smooth wheel travel and the long 65.9 in. wheelbase provides a smooth, comfortable ride. A beefy 16 in. rear tire and complementary 17 in. front tire have wide foot-prints and are mounted to bright, spoke-style wheels for a nostalgic cruiser look. Liquid-cooled, 90 cu. in. (1,462cc) long-stroke V-twin engine delivers the most power and torque in the 1,000 to 1,600cc class. Outstanding low-to-mid range output means smooth acceleration and comfortable long-range cruising characteristics. The 4-valve cylinder head with overhead camshafts and dual spark plugs increase combustion effciency to help ensure seamless throttle response, gutsy low-to-mid range output, better fuel efficiency, and reduced emissions. Low-maintenance shaft drive is clean-running and has minimal torque reaction as it efficiently transmits power to the wide 16 in. rear tire.